This article first was published by WDDE.org on December 11, 2012. Many Delaware parents of children with autism have been drowning in medical bills as they struggle to pay out-of-pocket for services not covered by their health insurance. Delaware’s new autism insurance law, which goes into effect today, promises to ease the burden for some but will likely not cover everyone. While most second graders worry about fractions, vocabulary words, and cooties, Gabe Otinsky of Middletown, Del. spent second grade repeatedly getting suspended from school and dreaming nightly that his father was dying. When he started telling his parents that he would rather be dead than alive, they decided to pull him out of public school and educate him at home. In many ways, Gabe is a lot like his peers. He loves playing video games, building with Legos, and playing the guitar. But he is also autistic and has difficulty processing sensory input. That means that things like flushing toilets, hairdryers, and scratchy clothes, which would be minor distractions to most kids, are extremely upsetting for Gabe, explains his mother Kathleen Otinsky. Today, Gabe is ten-years-old, the nightmares have stopped, and he has been able to focus on his schoolwork away from the distractions of the classroom. “School was just too noisy and too bright for him to be able to sit still and that whole social aspect was really making him uncomfortable,” Otinsky said. Otinsky would like to enroll Gabe in both sensory integration therapy, to help him learn to cope with overstimulation, and social skills therapy, so he can develop skills to interact with peers. However, she says the family’s health insurance does not cover therapies related to autism. She and her husband Howie have had to choose between the two, focusing on whichever seemed to be more immediately needed at the time. The financial struggle to pay for autism related services is a familiar one for many families in Delaware and around the country. In recent years, the number of children receiving autism spectrum diagnoses has exploded reaching a rate of 1 in 88 children nationwide, according to estimates from the Center for Disease Control and Prevention. Nearly nearly 1000 public school children in Delaware have been classified as having autism by the Department of Education. However, that figure only counts children that qualify for educational accommodations and does not include higher functioning children that are able to manage on their own in school, but still need additional services. Currently, there is no statewide data for the number of children with a medical diagnosis for autism. Like the Otinskys, many of those families struggle to pay for services not covered by health insurance. Thanks to a new law in Delaware known as the Autism Insurance Reform law, many families will now be able to bill their insurance companies for autism services for the first time. The law, which the governor signed in August, requires that all state-regulated insurance companies insert coverage for screening, diagnosis, and treatment relating to autism into every policy issued or renewed after the law goes into effect today. It is important to note that the new coverage will not go into effect for each family until their next individual renewal date, says Kim Siegel, policy director for Autism Delaware, a statewide advocacy organization that provides referrals, connects mentors, and offers education to Delaware families dealing with autism. Delaware is the 32nd state to pass autism insurance reform. Indiana passed the first of such laws in 2001 and many states have followed suit in the past five years. Legislative sponsors from both sides of the aisle introduced the bill to the legislature, where it passed without any opposition. Rep. S. Quinton Johnson (D-Middletown) cosponsored the bill with retired Sen. Liane Sorenson (R-Hockessin). Johnson has a child with a different disability and wrote in an email interview that he chose to sponsor the bill because he knows how challenging it can be to find the right services, even without having to worry about how to pay for it. “Imagine the feeling a parent would have knowing that there is a proven therapy that could significantly help their child and they can’t get that therapy for their child because they cannot afford it,” Johnson wrote. Later he added that he hopes that this law will allow for earlier access to therapy and ultimately reduce the amount of support that individuals with autism need in their adult lives. However, as Kathleen Otinsky recently learned, the law will not necessarily extend coverage to all families in Delaware. After helping to lobby for the bill and celebrating its passage earlier this year, Otinsky learned just last week that the new law might not apply to her family. Only health insurance plans that are bought and sold within the state of Delaware are subject to state regulation and the new law. Otinsky’s husband Howie manages a power plant owned by a large multistate corporation. Many multistate corporations and unions opt to “self-insure” employees rather than manage separate policies in different states that each have their own regulations. They may hire a health insurance company to process the paperwork, but do not actually purchase health insurance. The federal government regulates those plans under the Employee Retirement Income Security Act of 1974 (ERISA). Federal employee insurance plans also fall under these regulations. Currently, no federal mandate specifically addresses autism coverage. However, two of the ten essential health benefits outlined by the Affordable Care Act, behavioral health treatments and debilitative care, could be interpreted to include autism related care, says Judith Ursitti, director of state government affairs for Autism Speaks, the nation’s largest autism advocacy organization. 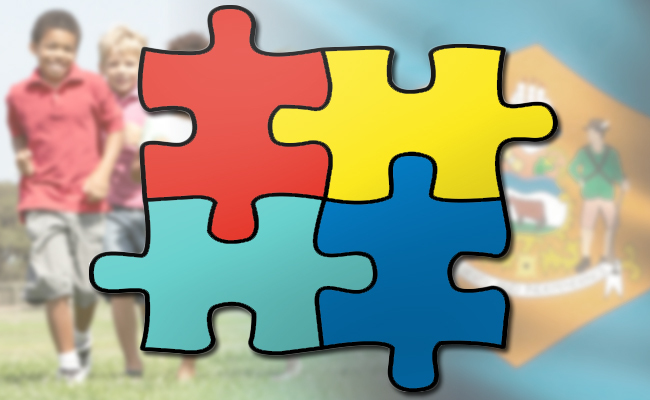 Recently, Autism Speaks has been lobbying the federal Department of Health and Human Services to add language to clearly define those sections with reference to autism treatment. In the meantime, Ursitti says that some ERISA plans have voluntarily started to cover treatments relating to autism. “One of our big efforts after we pass a law in a state, [is to then] focus on a lot of self funded companies that are based in that state. Right now, we’ve seen about 30% of self-funded companies start provide coverage for Applied Behavioral Analysis (ABA) therapy and other autism related treatment,” Ursitti said. That could be good news for the Otinskys if their provider opts to add coverage on its own, but for now Gabe’s access to therapies remains uncertain.